Just down Memorial Drive from Arty�s Grill and across the street from the sprawling complex of former Railway Express buildings that are part of Buffalo Central Terminal, can be found another "Classic Buffalo Tavern." Don�t let the "private club" sign in the window fool you, the G&T Inn at 68 Memorial Drive is open to the public and one of the best little parties in the Historic Polonia District. 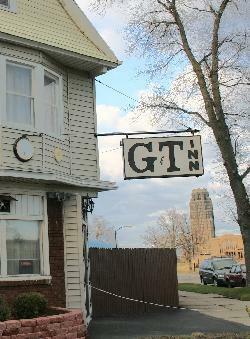 Just like other "classic taverns" which have great bar hardware, century old gin mill layouts and enough Genny Beer to fill the Genesee River, what makes the G & T unique is its owner. Eugene "Geno" Kiszelewski is known as Polonia�s "Singing Bartender." With spoons, maracas and a microphone in hand, Geno sings and dances behind the bar to vintage Marion Lush records while wearing a wig and cap taken from a Gallagher comedy concert. It does not get better than this. Honestly. The G & T Inn is open daily at 4pm. 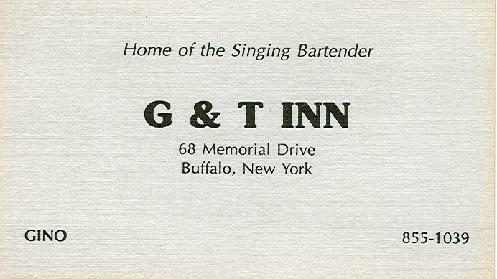 If coming down to the Market for Easter or exploring the Historic Polonia District, make the G&T Inn a stop....just tell Geno you are a member! Eugene "Geno" Kiszelewski is known as Polonia�s "Singing Bartender." Eugene "Geno" Kiszelewski signs along to vintage Marion Lush records.... you can't miss this act! Open daily at 4pm until ? Eddy says, "You can't beat these prices!" G & T Inn: Business Card from the singing bartender!